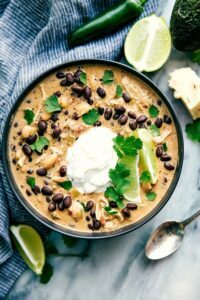 This healthy crockpot salsa verde chicken soup is mega flavorful and takes less than 10 minutes prep! 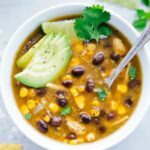 This Mexican-flavor inspired salsa verde chicken soup is not only a delicious soup, but it’s also one of the easiest & quickest meals to make! It is through and through a dump it and forget about it kind of meal with NO veggie prepping required! Literally dump some in some canned veggies + beans, jarred salsa verde, a few seasonings, and uncooked chicken breasts in your crockpot and before you know it, dinner is served! This is one of my favorite meals to make when the weather is cold outside and I have a busy day ahead — throw it all in and forget about it. 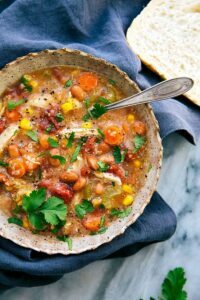 It’s also a soup the whole family loves and can customize to their own tastes. Serve this soup with some optional toppings and let everyone customize their own bowl just how they want it! Our favorite toppings for this salsa verde chicken soup? 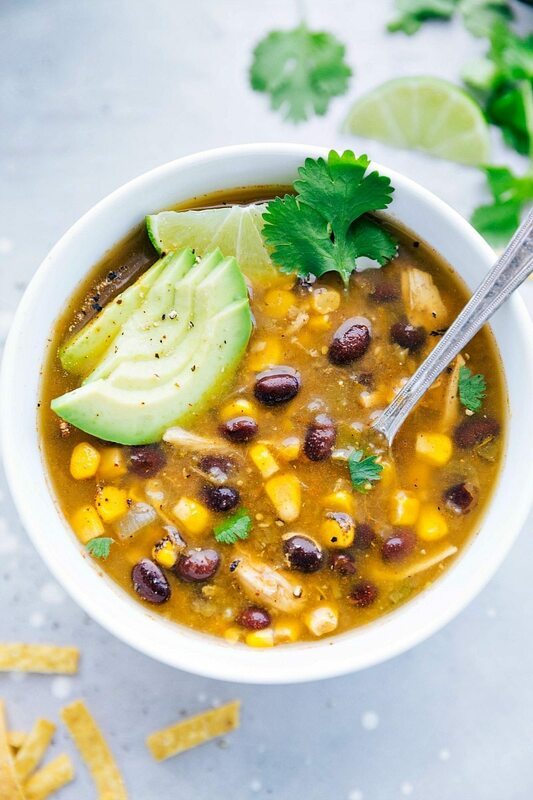 Remove the fat from the chicken breasts and add them to the slow cooker along with the chicken stock or broth, salsa verde, drained and rinsed black beans, undrained corn, cumin, paprika, chili powder, and optional bouillon cubes. Cook for 3-5 hours on high or 5-8 hours on low or until chicken easily shreds. Remove and shred the chicken, add the lime juice, chopped cilantro, any additional seasonings to taste (salt, pepper, more cumin or chili powder -- there's a bit of variance on additional based on the salsa verde you used; I err on less so you can always add more). Return shredded chicken and stir. Spoon soup into bowls. Top soup bowls with your desired toppings - freshly grated pepperjack cheese (we love lots of it! ), a dollup of sour cream, extra lime, extra cilantro, and/or a chopped avocado. I love salsa verde, Chelsea! One of my favorite mexican flavors. This soup looks incredible! Such a creative way to use salsa verde. So loving this! Pinning! Mmm….we make soup every week so I’m always looking for new ones to add to the rotation. Looks amazing and simple. What a colorful and beautiful soup! These flavors are delicious! I love salsa verde and even like that it’s green! 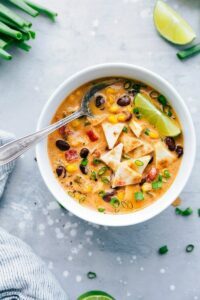 This soup is definitely going on my meal plan soon! It NEEDS to cool off here because I want soup for dinner!! LOVE this, pinned! I’m always looking for new fall soup recipes and love the combination of flavors in this one. And the fact that it is slow cooker is even better! THis just reminds me I never use a slow cooker, and have NO idea why!? 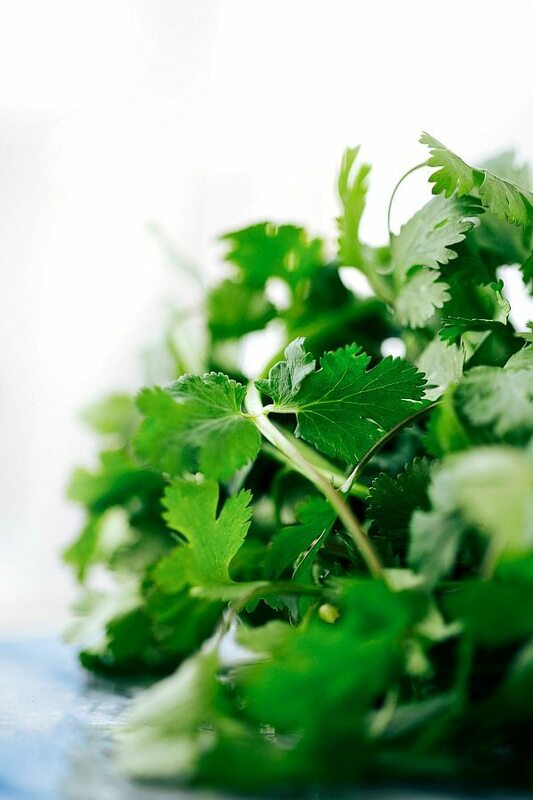 Salsa verde is a great flavor for soup! Added to soup collection. Hope all the soup helps everyone get better 😉 Thanks, Chelsea! YUM!!! My mouth is watering, I want a bowl of this soup for lunch! I love the flavors in salsa verde!! I agree though – the color is kind of gross looking!! This soup looks so delicious and comforting and I love the idea of adding salsa Verde! This looks delicious, so perfect for fall! I love salsa verde. It’s such a great thing to have in the pantry, it adds so much to recipes! Qdoba has THE BEST salsa verde. It’s too spicy for me but I still practically drink it. I love it. I’m definitely making this when my husband gets home. I know he’ll love it! oh my gawd!! I was *this* close to trying to make this yesterday but I could not find my salsa verde! I had to clean out my pantry today and I still can’t find it. . anyway, ended up making chili without it but I love salsa verde. . and love soup!! Pinning this one!! This soup looks so delicious Chelsea! I see we are both in soup season I totally shared one today too! Yummmm! We love salsa verde at our house! 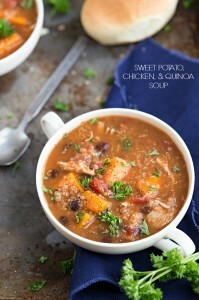 And this soup looks awesome – I love anything I can make in my crockpot! I hope you all feel better soon! Being sick is no fun! I loove salsa verde, and I really love that this is made in the slow cooker! So perfect for a lazy fall day 🙂 pinned! Slow cookers for the win! We are on a Mexican kick and I’m all about chicken dinners right now. You always take a classic and give it a new fresh twist! Awesome job Chelsea, pinning! I could definitely go for a bowlful of this gorgeous-ness right about now! I have a thing for salsa verde and I’m thinking I would love it in soup form even more! Love that it’s all made in the slow-cooker. 🙂 Pinned! What a flavorful and delicious soup Chelsea! Tomatillos are one of the things I love, but don’t cook with enough. I definitely need to go get some so I can make this! I love tomatillos and the zesty zing they bring to recipes! The only thing I don’t like is how sticky they are under the husk. But, once you get a taste of that fabulous-ness ~ they’re hard to resist. Looks great Chelsea! I’m definitely putting my slow cooker to work this Fall, and this recipe looks so simple and healthy. Love! I LOVE making soup in my crockpot! So easy and this looks so delicious! This looks delicious! Throw in a side of jalapeno corn bread and that’s a meal made for a king (and queen)! Tried this tonight and my husband and I loved it!! Going in the recipe book so I can use it over and over! I tried this this tonight and my husband and I loved it!!! Going in my recipe box to use over and over!! Just put this together in the crock pot!!! Looking forward to having a bowl when I get home from work… On this snowy Monday!!!! Keep warm!! I hope you loved the soup! I made this soup by the recipe last fall… And it was an INSTANT hit. I have since altered it a little… Doubled the lthe liquids and spices… And added peppers… Red Onion… Carrots and celery. It is a staple meal in our house now!!! Thank you for sharing this recipe with everyone!! My family loved this soup. Once everyone had a bowl there was chicken left, but not much broth. Do you have any suggestions on how to double the liquid? Double stock, seasonings,and salsa verde? Thank you! Happy to hear that! You can double the rest of the ingredients, or reduce the amount of chicken 🙂 Enjoy!